“The gem of the Istrian coast”, “the pearl of the Adriatic” how come I never heard of this architectural and historical treasure before – before I started planning our trip to Istria that is. Rovinj is stunning – bohemian and charming and the perfect base for us to relax but also to explore other parts of Istria. Right from my first glance of the old town huddled on a narrow peninsula and dominated by the Church of St Euphemia, I knew we would love it here, we did. The old town, car-free and packed with pastel coloured Venetian houses, reflected on the water on all sides is just gorgeous. 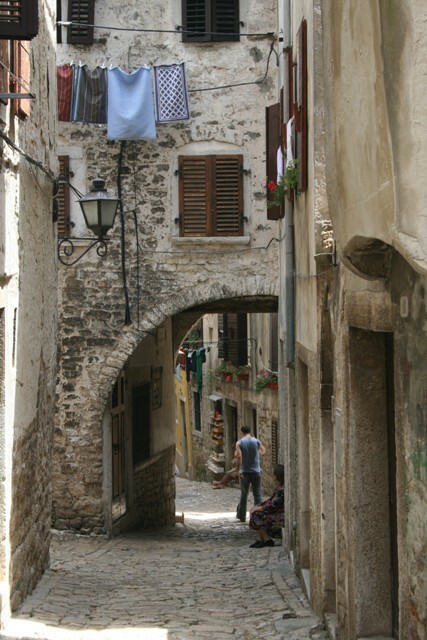 We spent lazy hours there wandering around the narrow, cobbled streets and hidden squares. The crumbling buildings make for a photo opportunity at every turn. We walked the steep hill up to the top of the old town and the church of St Euphemia. Son was a trooper – no complaints and only moderate encouragement was needed to get him there despite the long walk and the cobbles. They were slippery on the way up and positively lethal on the way down, but we made it. The views are glorious, even better if you take the 192 steps up to the church bell. 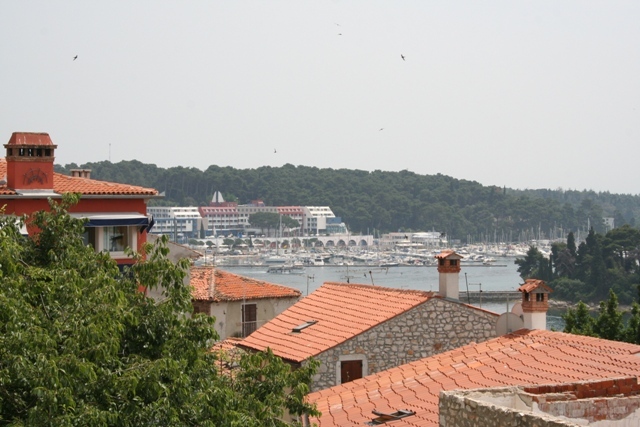 The reward is a vista of terracotta tiled roof tops, clear sea and the surrounding islands. We felt a real sense of satisfaction too at reaching the top of the highest bell tower in Istria. The interior of the church though is a bit of a let down – busy, noisy and graffiti on the pews – a real shame. 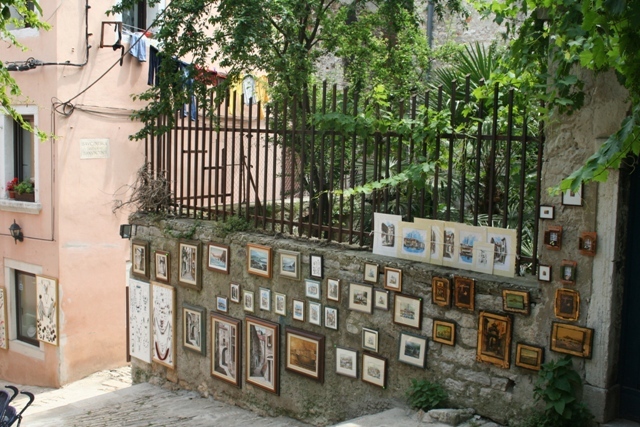 Grisia was one of my favourite places – the winding stone street that goes from the church to the sea that is filled with artists studios and shops selling trinkets and souvenirs. The quayside is lined with bars, restaurants, cafes and ice cream parlours. All tourist oriented without a doubt, but unlike some other places we have visited, it did not seem to matter here. Rovinj in the evening is special, the old town and the quayside suddenly come alive. One night we went to Valentino’s Cocktail Bar. It opens around 6, you wait at the door to be served and they bring you a cushion with your cocktail. You sit on the rocks, sip your drink and enjoy the sunset over the sea. Bliss, although with a lively 3 year old the cocktails were consumed slightly faster than normal. 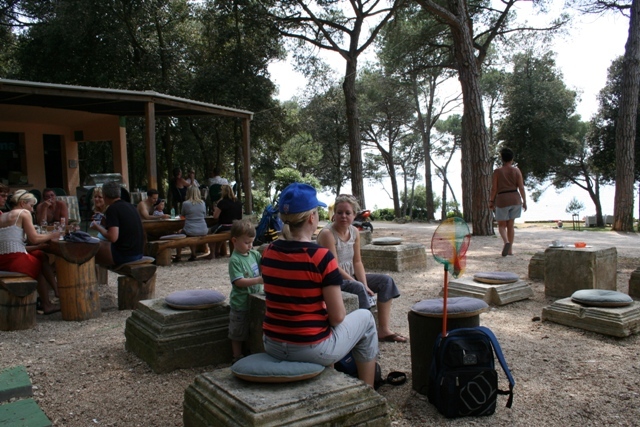 Zlatni Forest Park, south of the old town is full of pines, cypresses, shady paths and rocky coves. We hired bikes a couple of times and explored. The miles of track are fairly flat and easy going. 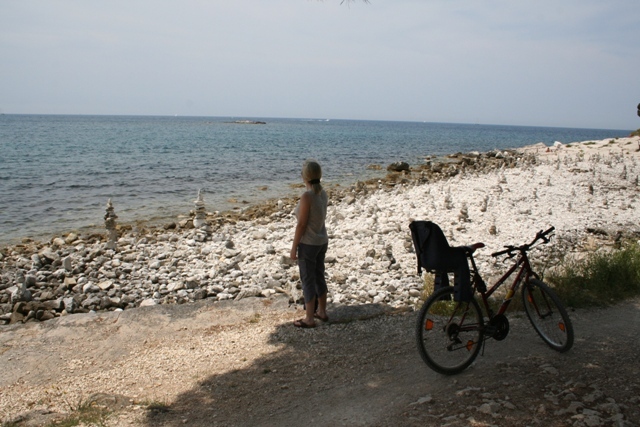 The further from Rovinj you cycle, the more deserted it becomes. We found endless pebbly coves where we stopped and paddled. We also found endless little cafes and bars in the forest selling delicious (and so cheap) sandwiches, snacks and drinks. The perfect way to make cycling fun. Our favourite was Grote – big stones for tables and seats, it was rustic and wonderful. Son also found his own amusement. 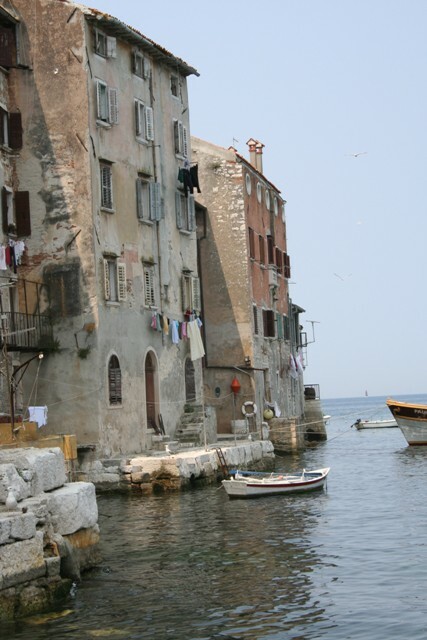 Rovinj, the gem of the Istrian coast and the pearl of the Adriatic, it’s not hard to see why. This was my favourite place in Istria, hopefully someday we can go back. It is a stunning place – definitely worth a spot near the top of the list!! That swing was a godsend! Time to actually enjoy your drink – that was a novelty. Gorgeous! Looks like a fantastic spot. It is – one of the most beautiful places I’ve been. Gorgeous photos! 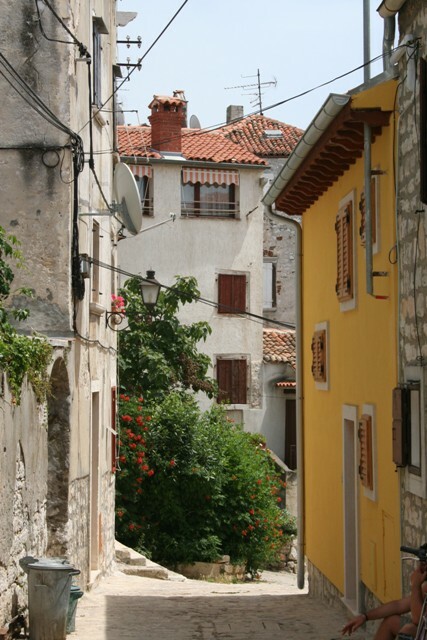 Istria has been on my list for some time now. Thank you – it’s a gorgeous place! We loved it there. Thank you… it’s a beautiful place, you can’t take a bad photo! Thank you – yes, it is such a beautiful place to visit. Great post! Rovinj is now in my bucket list. Thank you – it’s a gorgeous place! Looks like a great place to take photos at and have a break away from city life! Piggletino has been trying to convince his scout to make a trip down to Croatia… wonder what’s taking so long for the plans to come round! Hmmm. The scout shall have to read your blog more often to see why it’s so beautiful! It is a great place! Thanks for dropping by. What a lovely post. Croatia is on my dream list of places to visit. Thank you for giving me a more personal encounter from a distance. It is a stunning place – definitely worth visiting we loved it there. It looks like Italy. I go to Croatia next week and I wasn’t sure if I was going to go this far up, but now I feel I will have to. It’s a lovely area and has a bit of an Italian feel as well. 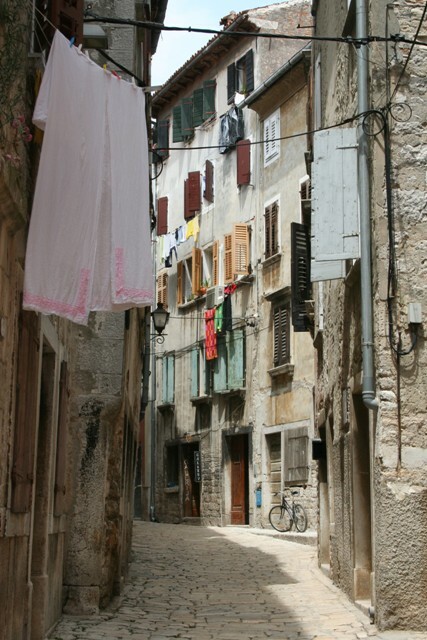 Croatia is so lovely – we only explored Istria but would love to go back and see some other parts! I can see why it would be your favourite destination for sure. great post and Croatia is medium way down the bucket list; probably expensive from Malaysia but cheaper than Italy I suppose. 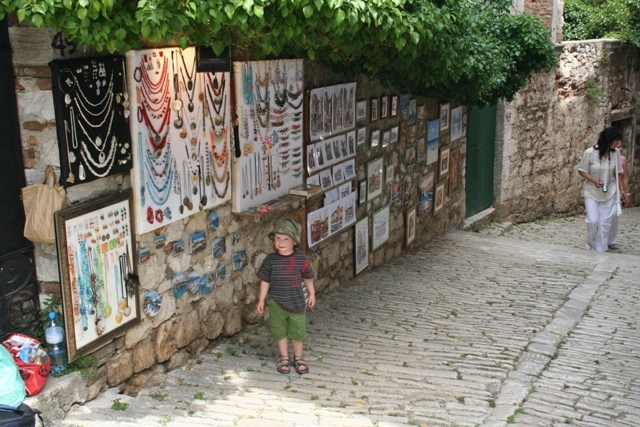 Definitely cheaper than Italy that is for sure – very similar though with the architecture and scenery, we loved it and Rovinj is especially gorgeous. This area of Croatia looks so similar to Italy as you mention above. How did it compare cost wise to Italy? Do you have a preference of one over the other? I am now off to read your section on CT in Italy. We found it incredibly cheap – way cheaper than Italy. 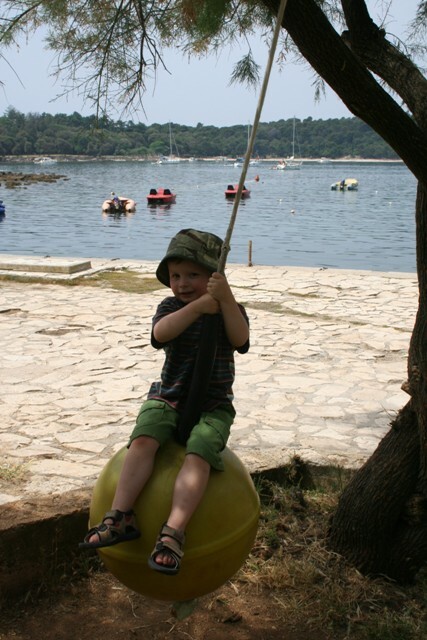 I don’t think I preferred one over the other though – we loved Rovinj and the surroundings but also adore Italy. The Cinque Terre is amazing – but much more expensive! I know.There is nothing to not like about Italy. Just amazing all way round. We have missed out on CT so we do want to go back and see it at some time. Croatia has been on our list but only during off season. 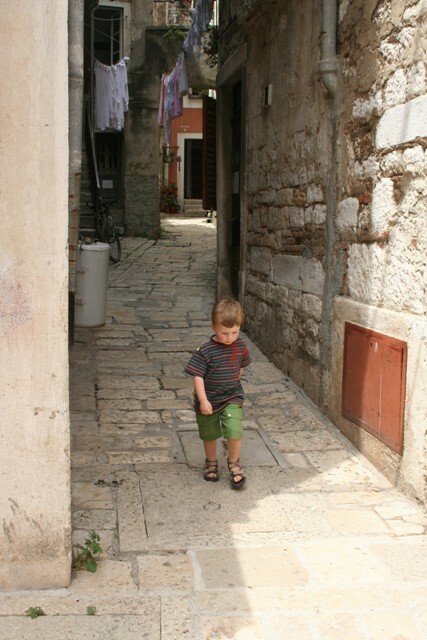 We were in Rovinj in June – it was pretty quiet then, we also went to the Cinque Terre in June – another story with the crowds but I still loved it. Hope to read about your trips to each of them sometime! Thanks for the info. So Italy in June is still pretty nuts. Needs to be more off season than that. So far our family travel has focused on Latin America and northern Africa. Cheaper for us than Europe. But I love Europe and my daughter just did a school trip there. Just for a family to eat and stay is just so much more costly.